If you’re paying attention to US politics, you may be aware of an emerging new economic theory supported by many US Democrats, including Congress ‘freshman’ Alexandria Ocasio-Cortez. This economic framework is generally known as Modern Monetary Theory, or MMT. In 2011, the poster child of mainstream economic thought, Paul Krugman, famously asked why there was such difference between Japanese and Italian interest rates. He noted Japan’s government debt dwarfed that of Italy – yet Japanese interest rates were always zero, while Italy (and most of Europe) was suffering from a sovereign debt crisis. However, a country like Italy is no different to a household. Like a household, Italy does not have its own currency-issuing central bank, and therefore can ‘go broke’. It was with this insight that many MMT scholars accurately predicted the inevitable Euro crisis almost 10 years before it happened. Recognising that money is not a constraint for government, many critics jump to the conclusion that adherents of MMT – known informally as MMTers – believe deficits do not matter, and therefore the entire framework is garbage. Yet there are many papers over the years where MMT academics clearly acknowledge deficits have always mattered – just not the way people traditionally think. There are historic precedents that support this notion of tax creating demand for fiat currency from diverse periods, including the colony of Massachusetts in the late 17th century and British colonies in Africa in the 1800s. Most failures of this system generally stemmed from overspending or weak taxation collection system (i.e. deficits do matter). Understanding the role of inflation is central to the MMT framework. In fact, MMT was one of the very few schools of thought that correctly predicted Quantitative Easing would not cause inflation. And as we have noted, deficits do matter from an MMT perspective, since too much spending crowds out real resources in the economy, resulting in price inflation. Furthermore, the economic history of hyperinflation rarely begins in an economy operating at full employment – more often than not, hyperinflation is a result in the collapse of the productive capacity of the economy. Fascinating article. In essence, MMT is a language, a way of describing the financial world, much like accounting is. I'd argue the whole thing is a matter of semantics. Wow ! This has got me thinking. I now understand I need to do a lot more work on understanding MMT rather than being dismissive out of hand. It also suggests that a lot of infrastructure projects currently being done by state governments, should really be done, or paid for by the federal government. Thanks Chez - having an accounting background is a huge advantage in understanding MMT (I know it helped me) - I think that is why so many economists struggle with the framework. Thanks Peter, State Governments can go broke but probably understand infrastructure needed more than the Feds. However I agree, the federal government can assist to fund any required infrastructure a modern economy requires- remembering the main constraint is inflation. A good explanation of MMT Chris. MMT does a better job of explaining some key economics issues, but it fails to understand the use and abuse of credit. For instance, you've argued that interest rates have fallen despite debt rising. This is true, but interest rate curves are lower as that reflects expectations of lower cash rates going forward. This holds as long as lenders expect repayment in the ordinary course. The minute creditors switch to expecting default, restructuring or repayment in excessively printed currency is the minute that interest rates rise to reflect the higher perceived credit risk. MMT will result in hyperinflation in the long term as creditors and investors abandon an economy (to go somewhere else with a stable monetary base) and as the cost of imports skyrockets. Japan hasn't seen that yet as it citizens are loyal to its bonds, a situation few if any other countries are likely to have on their side. Thanks for your comment Jonathan. "MMT does a better job of explaining some key economics issues, but it fails to understand the use and abuse of credit" My paper above simply focuses on the role of Government in the monetary system. Part 2 of my MMT primer (to be published next month) will focus on the private sector and the role of endogenous money - including the role private credit creation. Good challenging piece. Rothbard, Mises and the Austrian Economics school have a very different view on the role of money Chris & critique its application. Could be worth reading for the opposing view. Frank Shostak has some worthy papers on it. Great explanation Thankyou.. How recent is this concept. ? ie Did PM Gough Whitlam really need money lender Mr Kemlami ? Thanks for the feedback Steven. Some great comments on the role of taxation! Best summary of MMT from an Australian investment professional I've seen. Thanks. 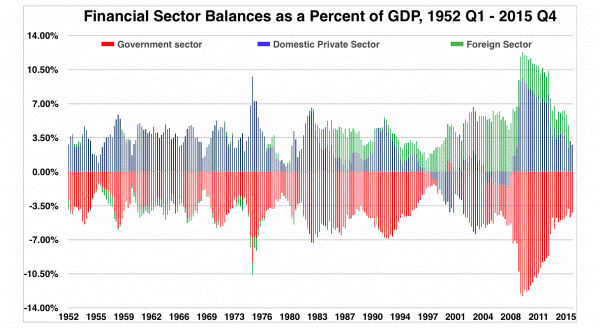 But the inference of both sides of politics attempting to 'move to a surplus' without consideration of the current position of the sectoral balances, especially with the current levels of household debt, implies an increasingly grave risk to the economy and mismanagement by politician and main stream economists.